When I was young, I worked for a short time in the herbarium of the National Botanic Gardens in Canberra. I was there when Princess Di visited and when a botanist discovered a new species of eucalyptus. There was some celebration, a feast, an exhibition, and the botanist was given a promotion. Years later, I heard a Coming Out show on the Australian network, ABC, in which a farmer’s wife described her connection to her country, her knowledge of the plants and animals, and her years spent watching a particular tree propagate and develop. She rang the Botanic Gardens to tell them she had found something they might be interested in visiting. The tree itself was probably indifferent to who identified it or how it was named. It had developed its own style of curvy leaf and its own rooted connection with the earth and the plants around it over thousands of years. In an unusual gesture, the expert botanist did not name this rare and old species after himself, nor did he acknowledge the woman’s respectful eye; instead, he paid homage to the tree itself, naming it Eucalyptus recurva. It says much about how I tell my life story, that I remember neither the name of the botanist nor the name of the woman, but I do remember the tree. Many years later, I have settled into a very different country, far wetter, more fecund, wilder, on the edge of the tropics. Like my grandmother before me, I am now part of bunya country. The story of the bunya tree, of who claims it and who owns it, echoes that of the eucalyptus. Two white men competed for the honour of association so that, after colonial contact, the tree had two settler names for a while: Pinus petriana, after explorer and early inhabitant Andrew Petrie, and Araucaria bidwillii, after botanist and surveyor John Carne Bidwill. Bidwill strategically sent specimens to the Royal Botanic Gardens in Kew, so the tree’s scientific name at least was settled. But I also know of the tree’s longer-term relationship with humans, with indigenous tradition and contemporary story. The Kabi Kabi kin group has a sacred connection to this tree, central to celebration for centuries. This indigenous perspective allows for the possibility of conversing directly with bunyas. Again, the trees may be indifferent to the importance of human nomenclature, but they are certainly not indifferent to humans themselves. They have partnered with humans to ensure their survival and to extend their range, they have suffered huge massacres in the early timber getting years, and they have an age-old wisdom that we may glimpse, even today, if we are still. My bunya country initiation was as cultural relations officer, developing friends and strong relations within the Aboriginal community. I know the Gubbi Gubbi dancers’ songs, and I am slowly piecing together the language and the ideas that lie within their sinuous words. My daughter, along with other darker-skinned youths, was ceremoniously smoked into adulthood by an artist and educator, a Kamileroi woman from the far west. My dark-haired, dark-eyed partner is respectfully called Uncle when we attend ceremonies, meetings, and dances. In contrast, I am white, pale skinned, bespectacled, fierce, but also humble, passionate, and hopeful that we might understand each other, borrowing the best of both cultures to construct another way of being in this world. Beverly Hand has similar aspirations. Despite our cultural differences, we have connected with our words; we both work to communicate this passion for nature and for country. I am sitting with Beverly at the Bunya Dreaming site. It is a beautiful place with a picnic area sloping down to the water. Once, there was a river wending through a plain surrounded by hills of bunya trees; now, it is a much wider dam supplying water to the region and fewer bunyas. Baroon Pocket is owned by SEQ Water, although once this place owned its people. Over the last nine harvest seasons, many have helped Beverly and her partner Michael prepare the place for ceremony, weeding the dance ground, slashing the grass, clearing the paths, collecting the nuts. This year, SEQ Water have got behind the bunya and its Dreaming; a young woman is discussing signage with Beverly to address the site’s many purposes of water supply, natural habitat, and ceremonial ground. Another man asks her about location of toilets, registration, parking, temporary fencing. Between the organising, Beverly tells me of her life. As with many Aborigines, it could be told as a hard life, full of class conflict and racism. But Beverly’s deep intelligence and self-reflection widens the lessons of colonial oppression to more positive role models. As with many Murris, her lineage is mixed. Although Kabi Kabi, she cannot claim a continuous inhabitation of her country. 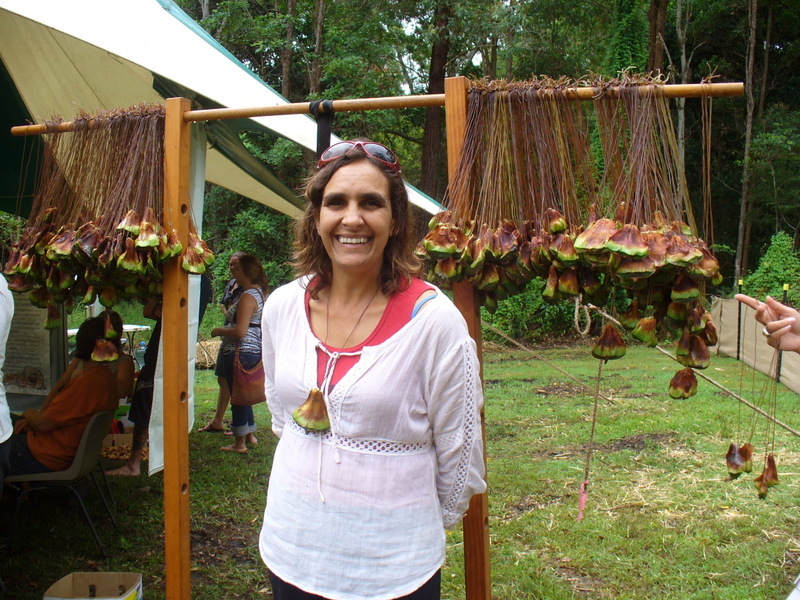 Beverly Hand, organizer of the Bunya Dreaming gathering, stands in front of welcome necklaces made of bunya seeds. Photo credit: Annie Gaffney. Beverly’s mother lived at Cherbourg, a distant Aboriginal reservation to which many were swept out of site, out of sight, after 1900. Her mother’s grandfather, Whardin, was an elder of his people, chief of the Kabi Kabi and given the anglicized name of Fred Emery, along with the ambivalent gift of a crescent-shaped metal king plate to be hung around his neck. Her mother’s grandmother was from around Mungindi, and removed to Cherbourg after burning a farmer’s wool shed down. Bev’s father’s parents were British immigrants (family friends with the vaudevillian, The Great Lazarus); her grandfather worked for the poet CJ Dennis and her father was born in a tent outside Tara on the Darling Downs. Bev’s parents met in a bible study class. Her father’s family was aghast that their son fell in love with a “gin”, their racism exposed. Beverly Bond’s early childhood was spent in Papua New Guinea. But along with her sisters and brother, her mother always told them stories of country. Her father, a patrol officer and sometime magistrate, was a hard man in managing the affairs of the New Guinea highlands. Beverly had a small taste of the experience of being the coloniser, rather than the colonised. Returning to Australia more than balanced that scale. She got A’s and pregnant at school; senior staff said her type wasn’t welcome, although the vice-principal offered her support to continue. But with a baby, a full-time workload, and pervasive racism, such support could never be enough. She trod a different path back to her country, having three more children and marrying Michael Hand. She directed her mind and heart away from more conventional academic expectations. After many years of living and travelling over her country, Beverly is now a conservation and land management trainer. In Walking Talking Country, Beverly Hand offers a no-nonsense creative understanding of a home in which she is fully immersed and versed. She is an honorary senior fellow at the University of the Sunshine Coast and has an Australia Day culture award. Along with a prodigious knowledge of white and black local history, Beverly offers another layer of knowing country. Her love of nature, of sharing stories, songs, dance and food, is both thoroughly researched and passionately felt. As the day heats up, we drive into town to get drinks. Sitting on the street of the nearby town’s coffee shop, our conversation is constantly interrupted by locals hugging, connecting, asking advice and assistance. Beverly is not just an indigenous elder, but also a facilitator for the town. I see both her mother’s passion for country and her father’s sense of justice. As the sun sets, I drive home through the Mary Valley, listening to bell birds and bunya trees, both of whom have a whole different agenda for relationships on earth. And I am grateful to Beverly Hand for cluing me in. Bidwill is difficult to pin down and harder to interview, as he died in March 1853. On the surface of it, Beverly Hand and John Carne Bidwill have nothing in common. She is a contemporary Aboriginal Elder, he a settler botanist and surveyor. But their stories are not simply black and white. Both travelled over the same country and fell in love with the Bunya. The bunya is not a safe tree to know if you wish to follow conventional paths. John Carne Bidwill was born in England, but started travelling from the age of 17. He visited many places and developed his passion for collecting plants, coming to Sydney with the hope of a land grant. While waiting, he travelled to New Zealand, finding many plants and writing a book about his “rambles”. He befriended John Macarthur and was recommended as the first director of Sydney’s Botanic Gardens. Full of ideas and scientific enthusiasm, his appointment was cut short by the late arrival of English nominee, Charles Moore, for the position. After much factional discussion, Bidwill was offered an appointment as commissioner for lands to the far north at Wide Bay (in what is now Queensland). Bidwill arrived by boat at Wide Bay Village in the heat of summer, November 1848. It was the furthest outpost of empire, pubs but no post office, “full of drunkedness” in Bidwill’s words. With the genteel manner of his white hat and umbrella and his controlling government roles of Chief Magistrate, Government Registrar, Clerk of Petty Sessions and Harbour Master, he did not fit in well. While he had often travelled with his sisters, he had never married. His surviving long personal letters were to other men, and his passions were mostly for flowers and plants. After announcing that the town’s river was to be renamed Mary after Governor Fitzroy’s wife (the town now Maryborough), Bidwill removed himself downstream to Tinana Creek, where he established a house and two gardens, one botanic and one food, on his “800 acre paddock”. His putative nephew, GW Dart came to live with him, part of his protection, not only against plundering Aborigines, but also against the townfolk. One local squatter, John McTaggart of Kilkivan Station, challenged Bidwill to a duel and upon refusal, attacked him with a horsewhip. To the dismay of many, Bidwill took no action when trader George Furber shot a native point blank in the street. And he further incensed local businesses, when he supported the downriver move of the township. Perhaps it came as a relief when he was instructed to survey a shorter road from Wide Bay to Moreton Bay. In any case, he packed up his dray along with four white men and some Aboriginal trackers and proceeded to get lost in the upper waters of the Mary River. Bidwell’s journey was over country I know well. To be fair, even today, this country is confusing to traverse, winding and very steep. When it was fully forested, it would have seemed impossible and impassable — difficult to recognise the often hidden Gubbi Gubbi pathways and the rough, quickly overgrown tracks made by settler, trader, and forester. Surveyors of the time record hiring blacks to help look after the horses and oxen, to clear lines and drag the chain, to hump and carry loads over demanding terrain, to lop branches and tear down vine scrub, to scale trees and make observations. It is clear that without Indigenous help, no surveying of this country could have taken place. It was, and remains, an easy country in which to get lost. Bidwell wrote a candid summary of his trip to the Chief Commissioner at the Crown Lands Office in Sydney on 30th May 1851. It was a journey in which troublesome blacks stole and speared oxen and men, Bidwill lost his compass, men deserted, Bidwill spent eight days wandering lost without supplies, and the two search parties also got lost. Bidwill was rescued by presumably less troublesome blacks who fed him grubs and honey and led him to the misplaced Durundur station. His wanderings took him past the place I now inhabit, along the tributaries of the Mary River, looking north to Cooroora Mountain. Bidwill’s report admits his black guide, Minni-Minni, had pointed out that the hill Bidwill thought was Beerwah was in fact “Karora”, but Bidwill assumed he was using a different tribal name. If Bidwill had been able to listen differently to those who knew the country, he may have lived longer. It is an interesting mark of the man that he also admits this in his official report. When Bidwill died in 1853, his illness perhaps aided by the after-effects of thirst and starvation, he was just 38. His reputation, research, herbarium, and beautiful garden rapidly disappeared. Botanic Gardens’ Director Charles Moore – the man who had taken Bidwill’s position – was sent to inventory Bidwill’s private plant collection, but thought it not worth transporting or preserving. Nevertheless, he gathered many seeds and specimens for the Sydney Botanic Gardens and for the Paris Expo of 1855 (to which Charles Parkinson of Wide Bay also sent a large Bunya cone). Moore consequently claimed to have introduced many of Bidwill’s garden plants into cultivation (such as a striking red grevillea) and sending others (such as Bidwill’s Queensland kauri) to botanic gardens and nurseries in England, Java, and South Africa. It seems William Macarthur also appropriated much of Bidwill’s research and experiments on hybridization (one notebook full of Bidwill’s handwriting was recently found bound into another publication from Macarthur’s library). The 1906 Sydney Botanic Gardens Director Joseph Maiden described Bidwill as “a self-effacing man, and in consequence few people know his great merits as a botanist”. By 1919, Bidwill’s garden had been vandalised and the bunyas and mango were ringbarked. Many of the forty specimens named after Bidwill have now been reclassified. So, Bidwill’s legacy in the flora and fauna of place vanishes; such are the claims and counter-claims of historical fact. We have mostly forgotten the man, but every Queensland backyard has a mango tree, and Queensland’s primary industry relied upon sugar cane for many years. Both were introduced exotic species brought here by Bidwill. In exchange, he sent many specimens, especially the bunya, to nurseries and botanic gardens across the globe. Despite an 1842 official proclamation to protect bunya trees as a sacred Aboriginal food source, their timber made them a target for rapid deforestation. While foresters harvested and destroyed large stands, Bidwill did his best to atone, sending seeds and specimens from New Zealand to Norway and every continent between. The Bunya’s Diaspora ensured more than its survival; it developed new geographies and human relationships. Four bunya trees planted around Bidwill’s gravestone demonstrated the things Bidwill had most valued in life. The Bunya Dreaming is a long tradition, and has been celebrated for centuries. Mostly, we know about it from the written reports, letters, and laws from the nineteenth century. By the early 20th century, institutionalisation of the Cherbourg reservation had decimated the bunya gatherings. But despite claims of the last gathering being in the 1840s, the 1870s, the1900s, and the 1940s, both the inhabitation and the celebration of country continue, dependent as always upon a strong personality determined to keep tradition alive: Fred Emery revived and created new songs and dances in the 1940s; his great granddaughter Beverly Hand adds her contemporary energy for reconciliation to this long practice. One year it rained all round the Sunshine Coast region, but at the Bunya Dreaming site there was a patch of blue and sunlight shone on the ceremony. Another year, two black swans sailed over the water with the men ferrying the fire. Recently, a koala sat in the central gum watching over the announcements of humans, while a multitude of crows danced their own wheeling ceremony above the sunset corroboree. Bunya Dreaming is often blessed by the spirits. Beverly’s friends and relations are invited with message sticks. There is a maximum of 400 allowed, so it is a gentler coming-together than many festivals. There is a momentary lull after the competitions of the morning. The bunya collecting, storing, shucking, cooking (and eating), the art-making, the storytelling, and singing has worn us out. But then Beverly announces the winners and the corroboree starts across the lake, slowly moving to the dancing ground and drawing us in. In the last shadows of the day, the Bunya Dreaming comes to a close. We have honoured elders and ancestors. We have celebrated the strongest teams; Bush Turkey or Goanna are the usual winners (and when Goanna wins they always point out that goannas eat bush turkeys’ eggs). We have had our yearly catch up with distant kith and kin; shared news, dances, and songs; commemorated deaths and births. And we have celebrated the bunya, a tree that provides so much more than its seasonal plentitude of nuts for feasting. It is in the process of collecting, shucking, opening, and cooking of the bunya nut that a necessary collaboration is born. In the process of sharing its feasts, a community is continually strengthened each year. The bunya shares its story with humans. Michael Pollan writes of how cereals have trained humans to plant and spread them, have made humans slaves to their reproductive requirements; cereals, though, reflect a nastier, more demanding, plant species: short lived with short timeframes and short sight. Bunyas live for centuries and also make their demands, but they are subtle and slow, with unusual focus upon growth and development for those that live within their bioregion. Just as the bunya season provides an excuse to collect, cook, and celebrate, so the bunya has slowly shaped our values and lifestyle. Hence the bunya becomes sacred, not only for how it meets physical dietary requirements, but also for how it collaborates with humans to meet more spiritual needs for happiness and connection both within and across species. It teaches humans to move from waste economy to gift economy, from global food exchange to local food development, from monetary measurements to nature collaborations. At Beverly’s Bunya Dreaming, all the food, prizes, dancing, competitions, and ceremony are shared freely. While Beverly receives some funding, most of her work relies upon donations of time and resources, rather than of money. She is a strong community facilitator, so more and more people and organisations offer their skills and labours in kind. Free boxes of fruit, juices, scones, tea, coffee and tables of prepared bunya foods sit alongside tables of books and gift certificates for prizes. Large, woven natural sculptures – the emu and the kangaroo, goanna, koala, and black cockatoo – are renewed by community every year. A handmade guitar of bunya wood is passed on each Dreaming to the most promising young singer. There is no waste economy here; this is a model gift economy. When surveying through Bunya country, Bidwill found nuggets of gold in the Mary River. He kept their discovery and location secret (only mentioned to his regular correspondent and friend, Phillip Parker King). He was absorbed by the flora of the country, by what grew, rather than by what might be mined. He was interested in the minerals of the earth only insofar as to the type of plant species they dictated. His nephew, GW Dart, said Bidwill was not interested in gold; he was a scientist. Perhaps he did not want the rush and the impact of people that gold would bring. In any case, he hid his find. It was not until 16 years later, that James Nash was credited with discovering gold and starting the Gympie gold rush. By this time, Bidwill was dead with his herbarium and reputation dispersed across the world. Perhaps this insensibility to money and fame, this focus upon a richer way of living, this passion for nature across two centuries and two people of markedly different tribes and cultures, is the bunya’s doing? John Carne Bidwill and Beverly Hand are just two of many examples of how the human and non-human worlds might interact and learn from each other. Instead of asking how we humans might appropriate nature’s resources for our own ends, we begin to ask how can we build upon our relationship with an active nature, how can we converse with the non-human world. We move past the bio-mimicry of Velcro and instead explore a paradigm in which nature is an actant, an active influence in shaping our more-than-human future. The wild lives around and within, full of complexities and uncertainties, amidst the collective arts of imagination. To meet its wildness, humans need to step down from our grandiose pedestals and get muddy. And perhaps we are. There are studies acknowledging the playful intelligence of animals, from octopi to crows. We have looked in the whale’s eye and the whale has returned our gaze. There is research showing the fungal communication and support systems between trees in forests and research that locates the brains of vines in their tendrils. We are developing ways to better measure the emotional responses of plants as well as animals, to understand that human impacts upon nature are greater than the biophysical. Ecofeminists showed how women led the way in reconnecting humans to nature: bodily linked, equally oppressed, perhaps. Meanwhile, indigenous and pantheistic understandings have always been such. We are all capable of attributing our intelligence, our emotions, our tools, our play, our humour and our dreams to the non-human world, often to animals, rarely to plants, and hardly ever to rocks, mountains, waters, or the land itself. Who speaks the land’s voice? Along with Bidwill and Beverly, I am interested in the language of plants, something more than botany, something as grand as the bunya’s sway. Another story emerges: a deeper story, not just about plant species, but about the tangible and intangible exchanges that move across all life. The bunya embodies the land’s voice, reminding us of our due relationship to nature. The bunya has its own wisdom to impart. This then is the cultural story of the Bunya Bunya, told from both ends of written history. This is the story of the long relationship that the bunya tree formed with the Kabi Kabi people and how together they reach out to a wider understanding. This is a story of colonial mapping and science, and of collective memory and contemporary celebration. It could be argued that this region’s history is encapsulated in the Bunya tree: a drawcard for feasting, the colony’s earliest conservation order which protected Bunya trees as sacred was then rescinded by Queensland’s first parliament, Bunya felling as part of an assimilation process in Cherbourg, and contemporary Dreaming opportunities for reconciliation. Here is a chance to unpick the sewn stereotypes and dissolve the problems of history using memory and mythology to create a different future. A future in which friends and family dance and meet in ritual and feast, celebrating local produce and understandings, in the shade of the Bunya, under the watchful care of mountains, in awe of nature’s active spirit, both its monsters and wonders, in the knowing of country. There is a sacred lesson, told through Botany, Beverly, Bidwill, and Bunya. 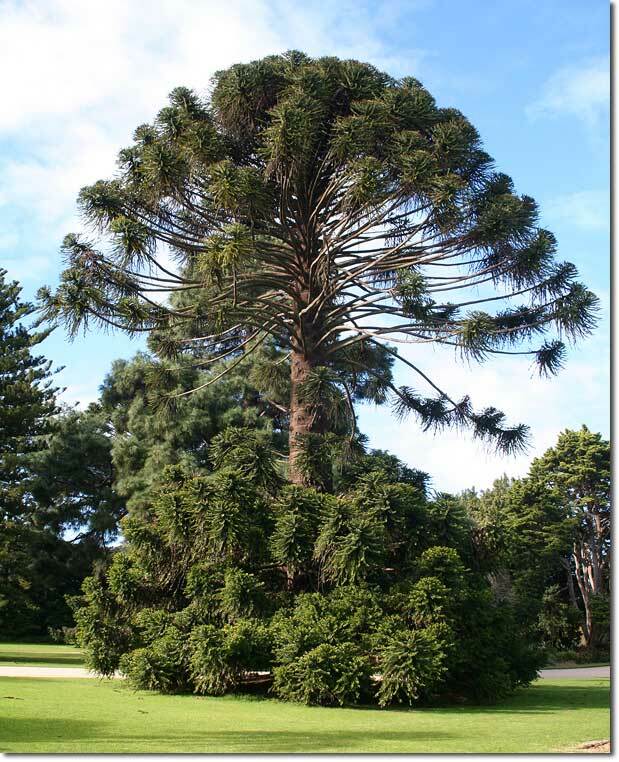 Perhaps, another scientific name change for the bunya (and yet another erasure for Bidwill), from Araucaria bidwillii to Araucaria bevhandii, might mark the bunya’s hope for collaborative celebration rather than colonial possessiveness, across the whole ecological mesh of nature. It’s February and for the first time in its recent history, the Bunya Dreaming has been postponed. Not even last year, in the midst of the worst flooding, had the site been quite so wet. It’s been deferred two weeks, because the first weekend of February is traditionally winter sport selection for the region’s many football teams, young and old. You can’t hold any successful Indigenous event that clashes with rugby. It’s February and the March flies are already biting. It’s February and this weekend will celebrate the strength, the resource, and the resourcefulness, the scarred and the sacred, of this more-than-human world. It’s February, and tomorrow is the Bunya Dreaming. Tomorrow’s lesson will be brought to you by the letter C: community, culture, creativity, and celebration. Tamsin Kerr is the director of the Cooroora Institute on the Sunshine Coast of Australia. She brings together art, culture, and environment through writing, consulting, and events so as "to tread lightly and joyfully upon the earth".